And welcome back to a clothing Sunday 7 – after last week’s Gallery Wall With Hidden Meaning Sunday Blog! It’s been half term here, and the older boy’s birthday (the day before) Halloween, so things have been pretty hectic here in the Threads household. Reluctantly, I’m not wearing the knit today though, as after wearing it to a Fireworks night last night, it now has a feint aroma of smokey bonfire and I guess I’m going to have to wash it! 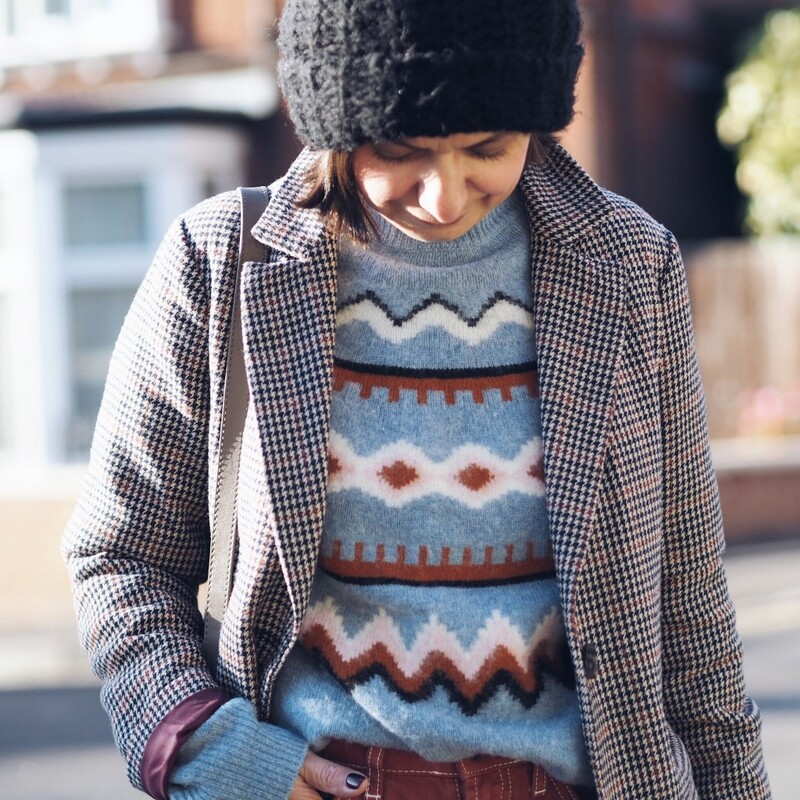 Anyway, having only recently blogged about cosy cashmere, why am I now blogging about knitwear again? 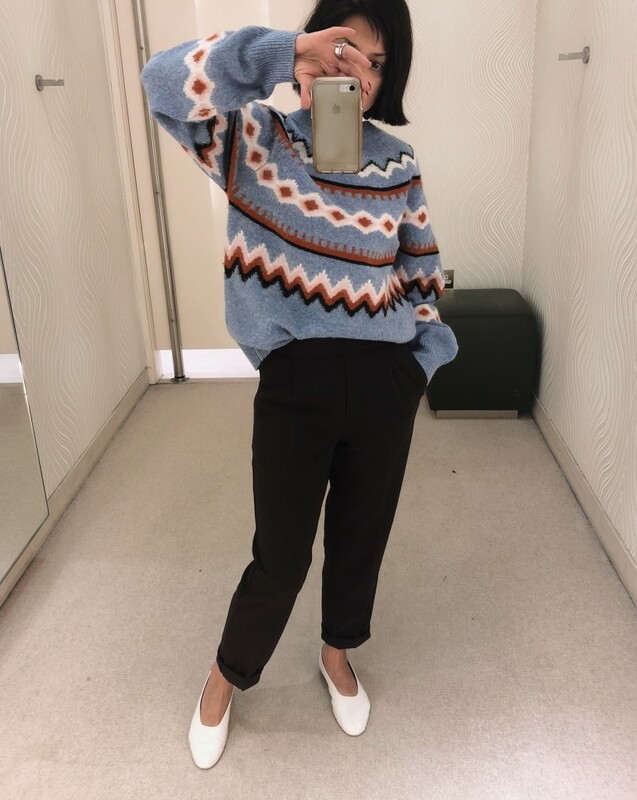 Being 5ft nothing, and weighing in at scarcely 7st might sound like I’m showing off: but the reality for me is that being extra petite, with a slight frame and narrow shoulders makes shopping a bit of a chore most of the time. I don’t want to spend more money on top of purchase-price to get alterations done as my budget is so tight and limited in the first place! I want to be able to buy off the peg, and feel… normal I guess. And knitwear… well, it’s the one type of clothing that looks good slouchy, a dropped shoulder is fine and where… there’s so much choice and variety… I can pretty much just buy off the peg and feel normal. 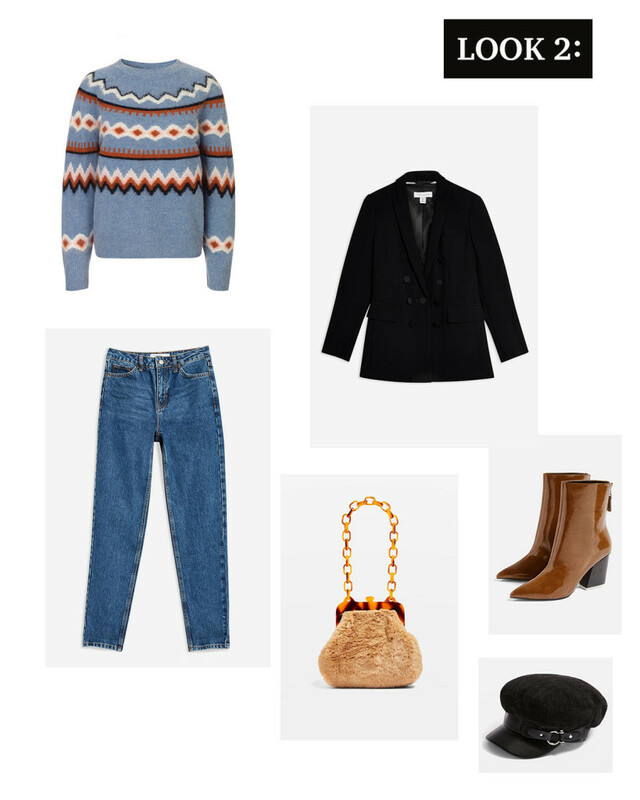 For the most part, I’m going to veer off the highstreet for this blogpost, which isn’t to say there aren’t fabulous patterned knits to be had from the usual suspects. However, having grown up with hand-knitted sweaters, of the absolute finest quality – made by my mum, I can’t help but feel that investing in a good quality, well made knit is a purchase well made. Caramel & Cream… how beautiful! Giving me all the Ski-Sunday vibes too! My only reservation about this sweater is the mohair content is quite high (32%) which means it may well be super itchy. 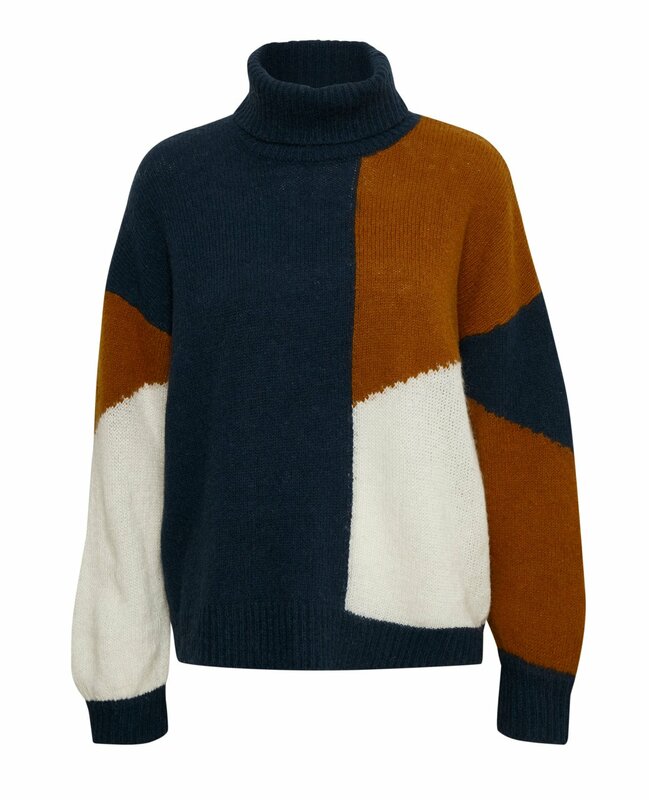 The rest of the composition is a 40% polyamide and 28% wool which is a great mix as it means the jumper is unlikely to pill too much. 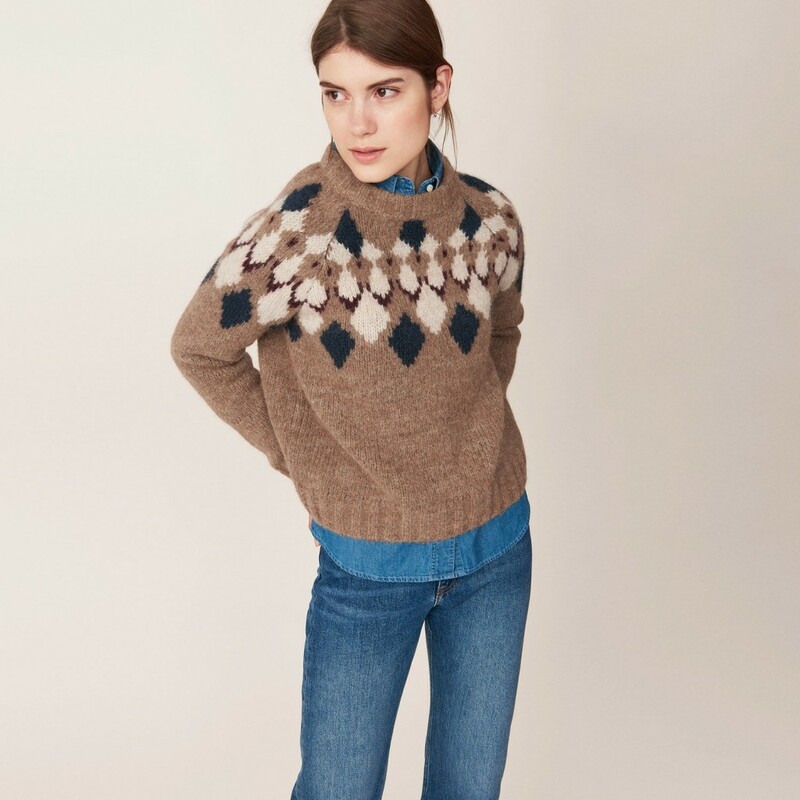 Spotted this gorgeous knit in the Gant store in Bristol on a recent visit there… after the painful process of jeans shopping with the husband, I only had an hour or so to browse the shops myself. So, with such limited time, I decided to look in shops which I normally don’t have access to… and that’s when I spotted this knit. Things to note: it’s very thick, and has a predominately wool content – which is actually a mix of Alpaca and regular (sheep’s) wool, which means, the knit won’t be terribly itchy, indeed, probably not at all. I tried on the size S and though quite wide, was ultimately, a good fit on me. 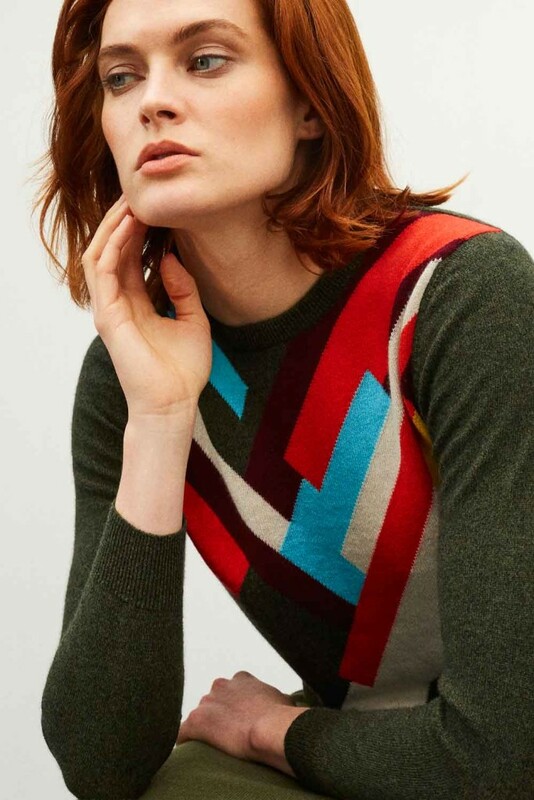 It says on the Gant site that the model is wearing a size s, which I find a little baffling, as the jumper was the same ‘shorter/cropped’ length on my shortarse! 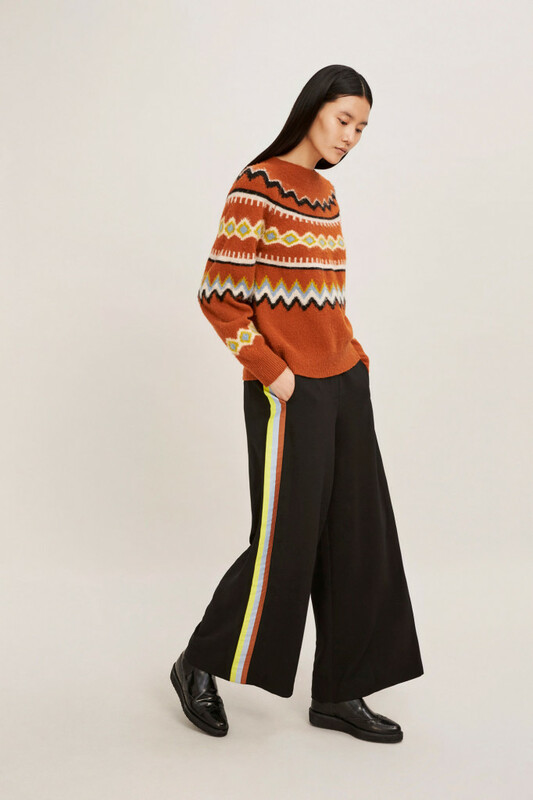 The jumper is available in size XS – L, but I’d say if you’re very tall, then this knit may well be too cropped for you. I have found this sweater cheaper from this site: www.cho.co.uk for £124, and you could save a further £20 by using code SUBSRIBESAVE; however, I’ve no experience of this site in terms of service and I’ve been informed they don’t do returns… I guess you need to have tried the knit on else where and be 100% sure of your purchase before buying from this site. I’m currently thinking about this one… A LOT! 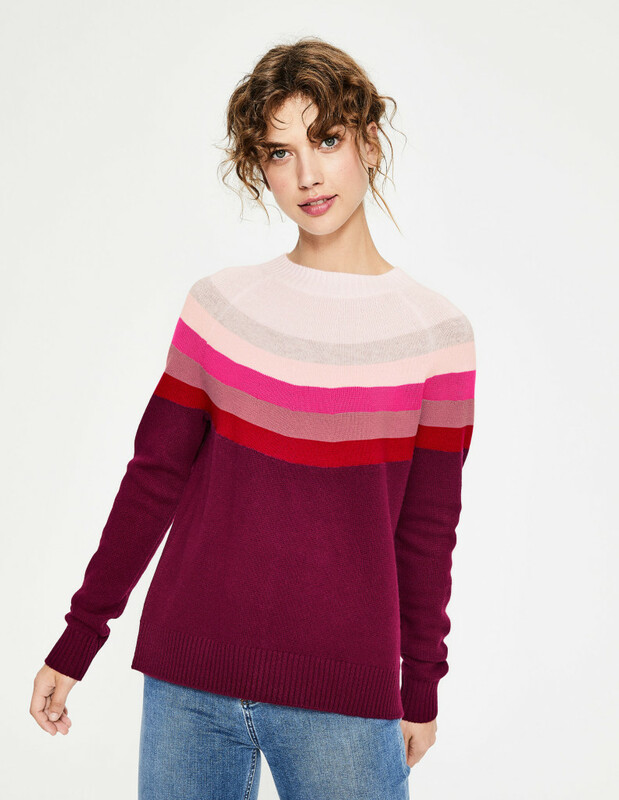 I’m including this knit because although it’s not the most… erm… patterned knit, it’s still a knit with a bit more interest than a plain knit, right? 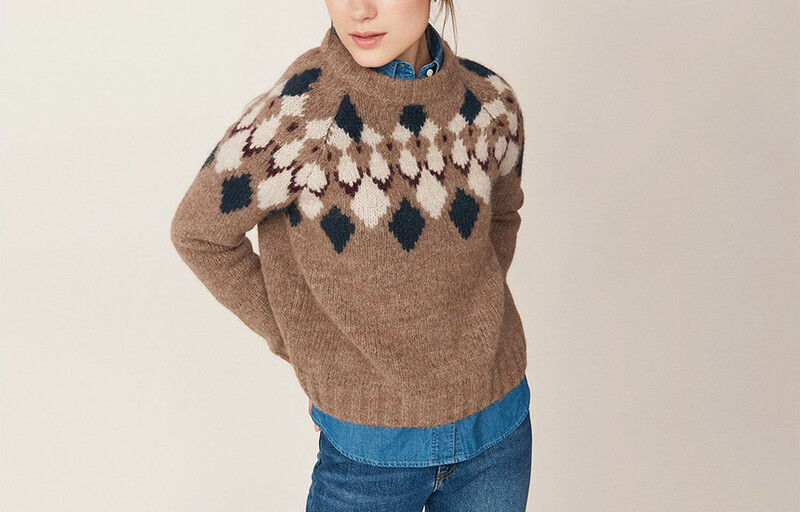 This Helena Jumper has a good balance of wool to man-made fibre mix. It’s also available in Navy and Ivory. Imagine it with Brown cords? Or just your favourite blue jeans? It’s a wool & cotton mix, so again, there would be minimum pilling and would wash really well. I feel like I’ve been pretty colourful and rather generous with my patterned knits offerings so far, given I’m a bit of a plain-jane-fan? As such, bringing a little bit of my comfort zone to the proceedings is quite necessary: monochrome CHECK and stripes CHECK! Again, the sizing appears to be on the generous, oversized side given the XS/S is an 8-10, rather than what I’d expect – a 6-8. Anyway… I’d probably steer clear because of the 27% Mohair content: itchy and moulty no doubt? But aside from that… if you can handle a bit of knitwear itch… it’s a very cool sweater. I think it’s the maths geek in me which is drawn to this pattern. But… let’s talk about the price shall we? 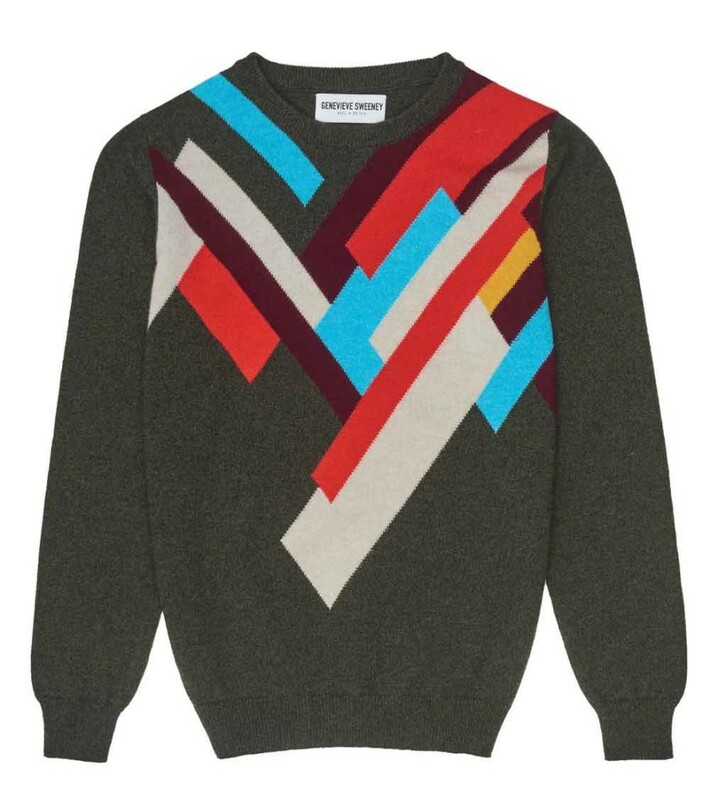 It’s way beyond my normal day to day, and indeed, over double what I might ‘splurge’ on a ‘treat’ knitwear piece. 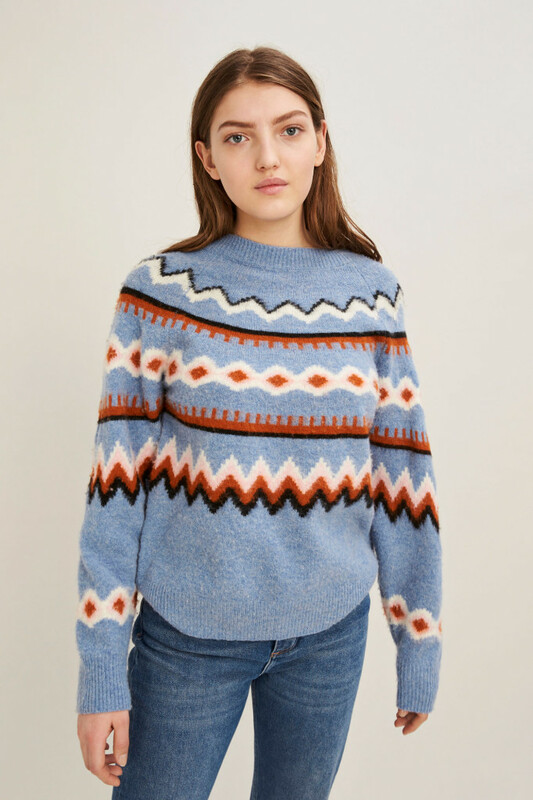 However, once you realise that this sweater is made by hand intasaria knitters, at a mill in the Scottish Borders using Scottish spun cashmere… the pricing starts to make sense. There are other colour-ways, all of which are pretty gorgeous. Think I need a lottery win – don’t we all?! Failing that, a reasonably paid part time job would be nice… fat chance here in the shires, of course! So for now…. the knit is on the lust-list and the Genevieve Sweeney Sock Subscription on the Xmas Wish List! … and I can see it would look good. It’s just too intense for me to wear. And for that reason, and that reason only… this is my Stinker this week. So this is the knit I bought in Harvey Nichol’s in Bristol. The one I can’t seem to stop wearing. So I feel a bit of a cheat, choosing it as my Wildcard item, but given pale blue isn’t one of my ‘best’ colours, and given the pattern/colours are quite loud… this sweater is definitely outside of my comfort zone. And yet, I’ve loved wearing it these past couple of weeks, which shows, it’s sometimes good to step outside of your comfort zone. Again, I’ve found this knit cheaper on www.cho.co.uk for £119.20 with most sizes in stock; as before, you can save a further £20 using code SUBSCRIBESAVE and as before, I’ve no experience of this site in terms of service and I’ve been informed they don’t do returns… I guess you need to have tried the knit on else where and be 100% sure of your purchase before buying from this site. This is the only one of the 3 looks I haven’t worn myself, although I was hoping to recreate, with a recent Topshop Satin Bias Cut Skirt Purchase. Unfortunately, Topshop were unable to fulfil my order due to high demands, and so my order was cancelled. 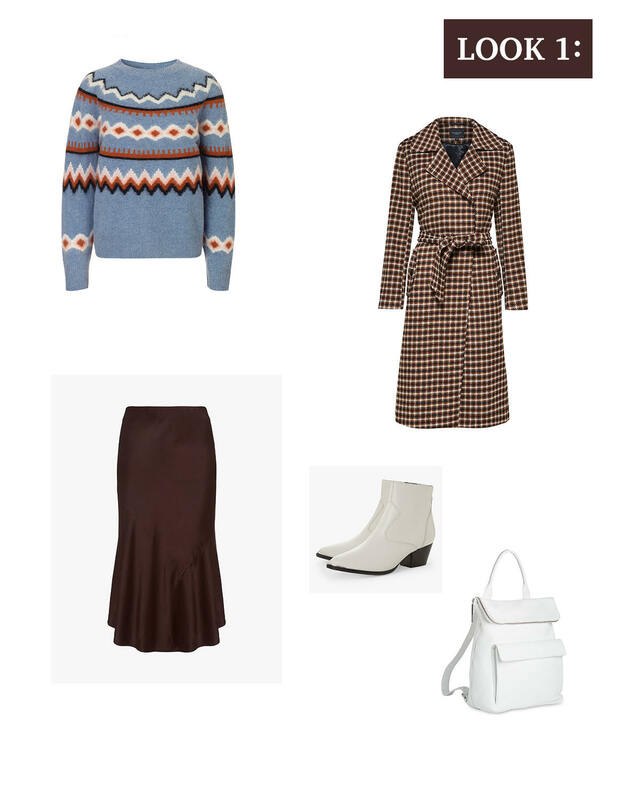 Anyway, half tuck your chunky knit into a Mint Velvet Satin Dip Hem Skirt (£79) and wear some Dune Prairie Cuban Heel Boot (£130) on your feet for a perfect “Dressed for the ‘gram” kind of street style look. Chuck a Selected Femme Wool Check Coat (£210) over your shoulders and carry your Whistles Verity Large Backpack (£280) by the hand strap, whilst looking at an interesting blob of chewing-gum on the pavement, or gazing into the middle distance with a wistful smile… and that’s your Instagram Money Shot right there! You could wear any coat or jacket of your preference, but I’m opting for a smarter Topshop Satin Button Tuxedo Blazer (£69). 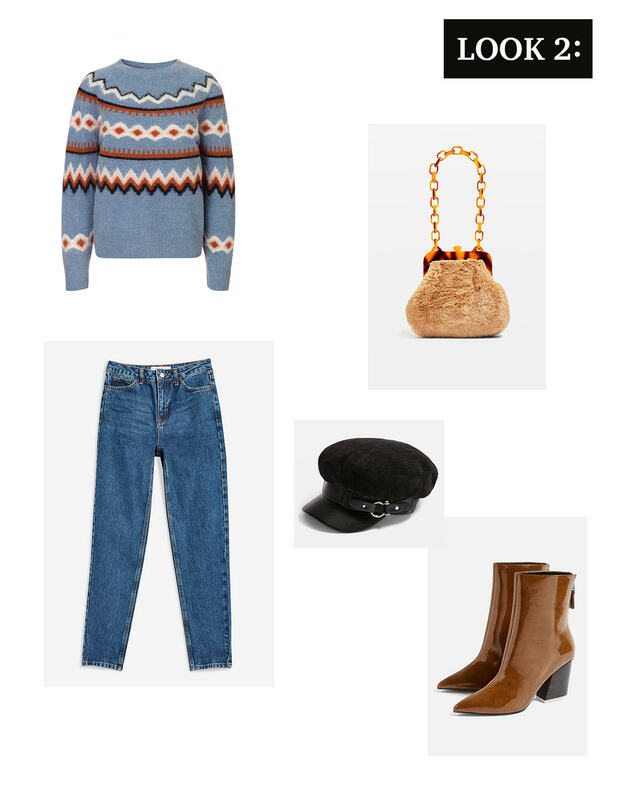 I’ve used this Topshop Faux Fur Tortoiseshell Shoulder Bag (£25) before in previous wildcard looks because I love it, and think it would work really well with this outfit! For this look, I’m going a bit matchy-matchy, as well as clashy-clashy! 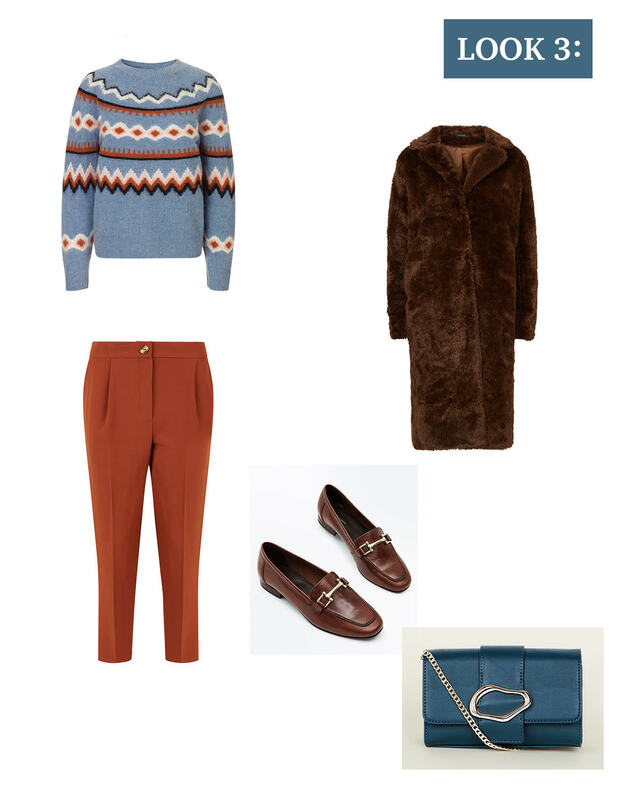 I’ve plucked out the orangey-rust from the knit to tie in with these New Look Rust Tapered Trousers (£14.99), but opted for clashing, proper brown New Look Brown Leather Front Bar Loafers (£29.99). As the fabric of the trousers is thin, you’ll need a longer line New Look Dark Brown Faux Fur Maxi Coat (£59.99) to keep you warm. And this cute New Look Teal Squiggly Buckle Chain Bag (£15.99), a total clash of blue to the knit, would just look cute with this outfit. So that’s it for this week: thoughts, please? 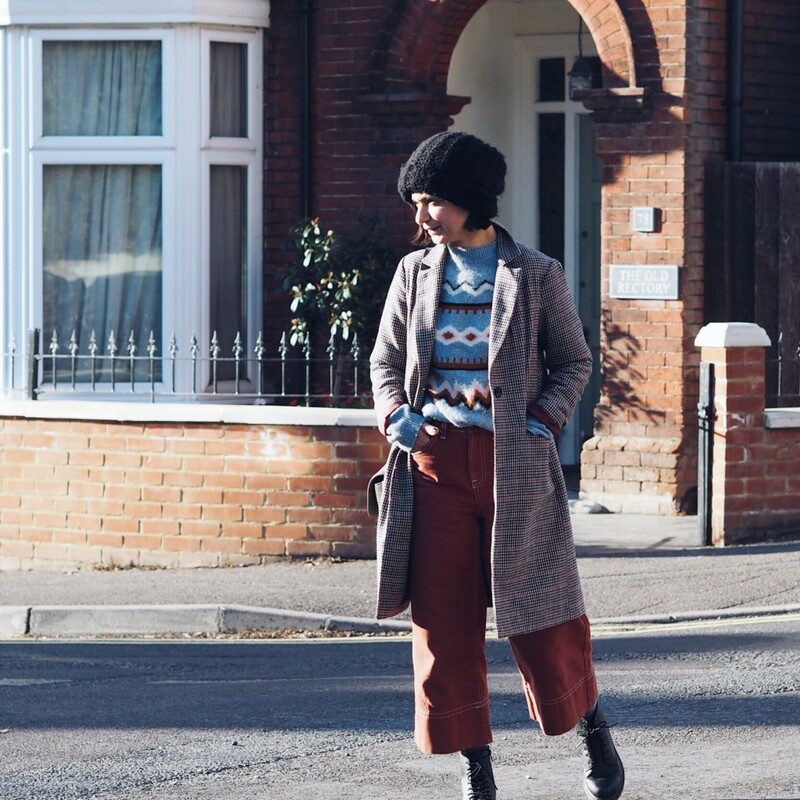 I’m desperately trying to *not* wear my Samsoe & Samsoe jumper every single day… but I’m quite repetitive, and… well, if you follow me on Instagram… prepared to get bored of seeing me in it! As always, thanks for reading… leave me a comment and I’ll get back to you. Thanks Sue! I will re read the returns… and edit the blog.